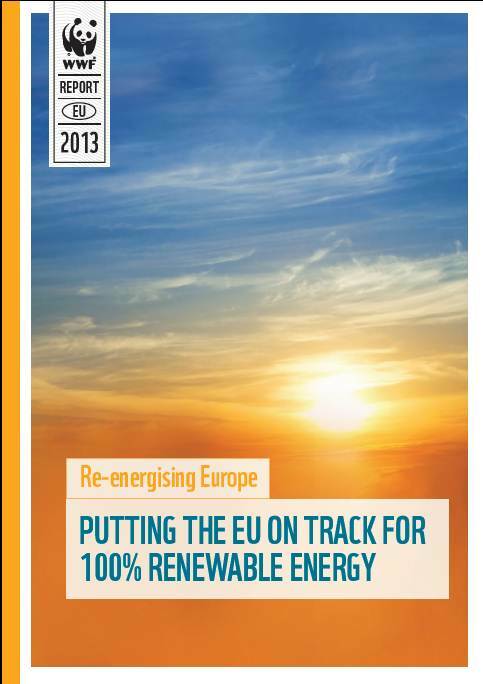 Today WWF launched a new report – Putting the EU on Track for 100% Renewable Energy – which shows where Europe needs to be by 2030 in order to reach a fully renewable energy system by 2050. It is comes just as the European Commission is beginning to consider post-2020 climate and energy plans. Brussels, Belgium – Today WWF launched a new report – Putting the EU on Track for 100% Renewable Energy  – which shows where Europe needs to be by 2030 in order to reach a fully renewable energy system by 2050. It comes just as the European Commission is beginning to consider post-2020 climate and energy plans. •	by doing both, reduce its energy related greenhouse emissions by 50% compared to 1990 levels. 3. In 2011, WWF released The Energy Report based on the specially commissioned ECOFYS Global Energy Scenario. The report showed how, by 2050, the planet’s entire energy needs could be met from renewable sources. The first step to reaching this goal is to limit energy use in absolute terms. The second step is to scale up energy supply from current renewable generation technologies (prioritising their delivery in order of sustainability - solar, wind, water, geothermal, and only then bio-energy under strict conditions). 6. More energy savings and renewable energy are also needed to protect the planet. This summer (2012), more Arctic sea ice melted than ever before - with the result that there was nearly 50% less ice than the 1979 to 2000 average. The record melt was bigger than the previous record by an area about the combined size of Sweden and Finland. Furthermore, research on the impact of continuing to burn fossil fuels has revealed that the health and environmental costs of generating energy in some countries are higher than the value of that energy once it is produced. The WWF report shows that by 2030, the EU could be reducing its energy use by more than a third and generate almost half of the remainder from renewables. WWF report "Putting the EU on Track for 100% Renewable Energy"